Original Amnesia Automatic is a 70% sativa, 30% indica cannabis plant. It was bred by crossing an original Amnesia with a Haze auto-flowering strain to produce a plant that will mature irrespective of any shortening of (day)light hours. Original Amnesia Automatic retains the positive traits of the Amnesia but in a form that will grow vigorously just about anywhere. Depending on conditions and environment plants will grow to between 75 - 150 cm. tall with slender leaves and developing long buds reminiscent of fox-tails. Indoors yields of 75 - 150 gr/plant will be yours in 75 - 85 days from germination. Outdoors it thrives in warm, Mediterranean-type climates but is also successful at higher latitudes and altitudes when grown in a greenhouse environment. In such scenarios yields will be in the region of 100 - 250 gr/plant. 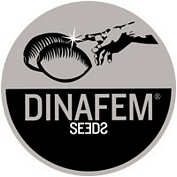 Dinafem recommend replacing one third of the soil mixture with coco coir which has the effect of providing the roots with more oxygen and also assists with nutrient uptake. Watering should be little and often rather than a good soaking now and again. Smokers will detect aromas and flavours typical of top-quality sativa strains viz. lemon, cedar, Haze and spices. THC production is between 9% - 13% with medium (between 1% - 5%) of CBD. Its effect is very powerful and tends more towards the cerebral than physical.